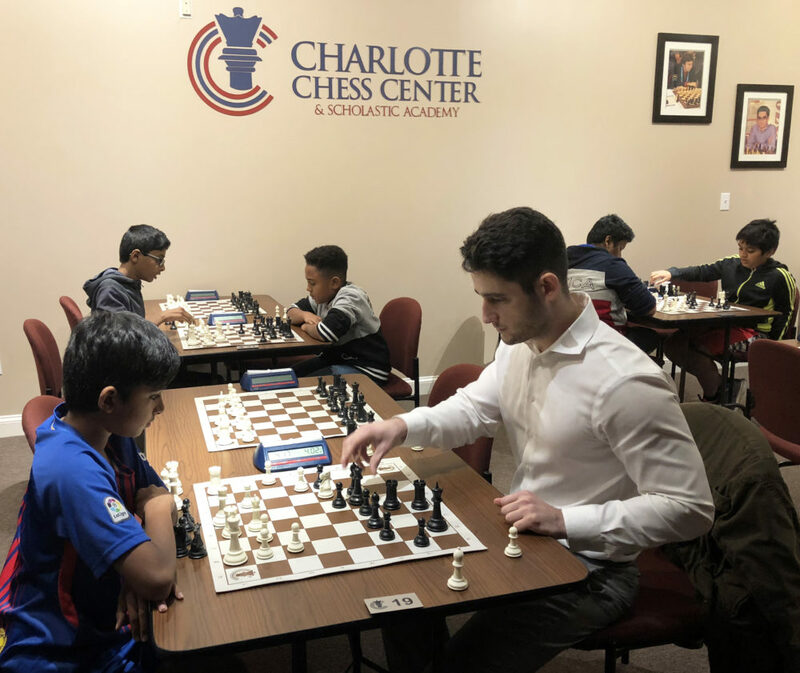 While tooling around the interweb looking for information on the Land of the Sky Chess tournament which began last night (the second, hurry-up part of the first round is ongoing as I punch & poke) I discovered a nice article featuring the Charlotte Chess Center and Scholastic Academy. Notice the sign proclaiming only “Chess Club.” I began playing at the Atlanta Chess Club, which was held in a YMCA on Lucky street in downtown Atlanta, Georgia. It is where I won the 1976 Atlanta Chess Championship. My most vivid memory, though, is of the time there was a running gun battle right below on Lucky street, with real bullets being fired, between the cops and crooks. Most players went to the window to spectate. Fortunately, we were on the second floor so no bullets came our way. So engrossed in my fifteen minute game I stayed seated during the reality “show.” There was a Manhatten Chess Club, which is no longer in existence, and the Marshall Chess Club (http://www.marshallchessclub.org/), which is still open. The website shows an Adult Chess Class “Every Tuesday Night!” The oldest Chess club in the US is the Mechanic’s Institute Chess Club in San Francisco (http://www.chessclub.org/index.php). 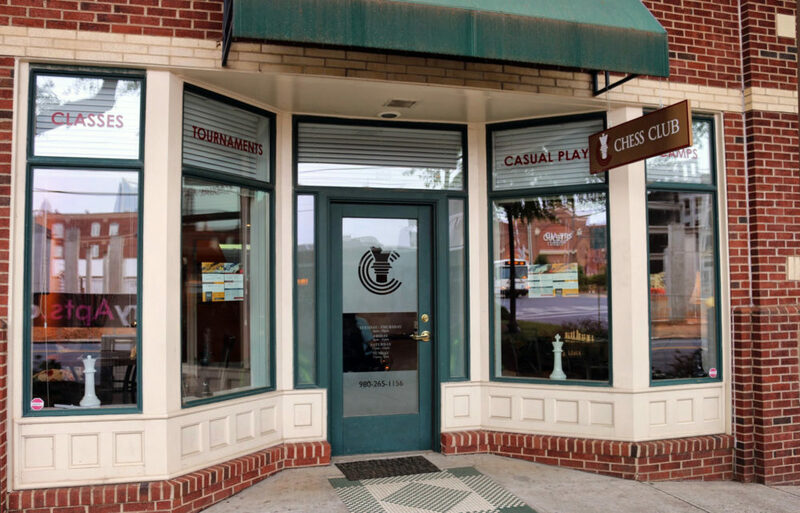 All ages are welcome at these venerable Chess clubs with no need for adding the word scholastic like all newer Chess clubs, such as the St. Louis Chess Club and Scholastic Center (https://saintlouischessclub.org/), have done. “Since middle school, chess has been an integral part of Peter Giannatos’ life. He’s participated in more than 200 tournaments, and is recognized as a master level player. In fact, he’s a top-10 player in the state. After graduating from UNC Charlotte in 2014, Giannatos, 26, figured he would concentrate on joining the working world. He had dreams of making chess his career, but knew that could be a longshot. It looks real nice, unlike the Atlanta Chess Club & Game Center, which was also known as “The Dump” for good reason. As a matter of fact, the Charlotte Club looks downright OPULENT in comparison! Although growing by leaps and bounds, Charlotte is no where near as large a city as Atlanta, especially when surrounding cities many miles away not in the city limits use Atlanta as their city in much the same way as people in the area of Atlanta known as Buckhead, where the Governor’s mansion is located, have done. The ‘Head has kept expanding because every business wants to be known as being part of Buckhead. One hundred fifty members seems a strong number of members for the relatively new Chess club. I do not know the exact number of members the ACC&GC had at any time, but I do recall returning to work there when it had dropped to only a handful, or maybe two handfuls. It got back to me that the owner, Thad Rogers, said upon my return the number of members had grown to almost as many when the place first opened, which made me proud. I hope to be able to visit the CCC&SA before I go to the Chess club in the sky. For all of my international readers, if you come down South I hope you include the Charlotte CC&SA in your itinerary. Chacha Nugroho sends this report on the Southeastern FIDE Championship, which will be held at the Charlotte Chess Center & Scholastic Academy (http://www.charlottechesscenter.org/). The first round is Friday, October 31, 2014; 7:30PM. The website (http://www.charlottechesscenter.org/#!southeast-fide-championship/cxan) shows 31 players on the Pre-Registered List, heading by GM Ben Finegold. IM’s Ronald Burnett and Kassa Korley have entered, along with FM’s William Fisher, the number two seed, and Peter Bereolos. Georgia players include Benjamin Moon; Reece Thompson; Grant Oen; Kapish Potula; Arthur Guo; & Carter Peatman. Just want to give you information that Peter Giannatos will broadcast games from Southeastern FIDE Championship. And in ChessStream.com as well. He as at least 1 DGT board, but we trying to provide 3 DGT boards for 3 live games. I probably will ask Peter to have scan of scoresheets during the tournament, so crowd may help to convert to PGN as well, like in US Masters. The turn has been made at the US Masters and the players have hit the long stretch and are heading for the finish line. Heading into the penultimate round NM Michael Corallo, even with his loss to GM Sergei Azarov on board two in the antepenultimate round, is leading the contingent from the Great State of Georgia. 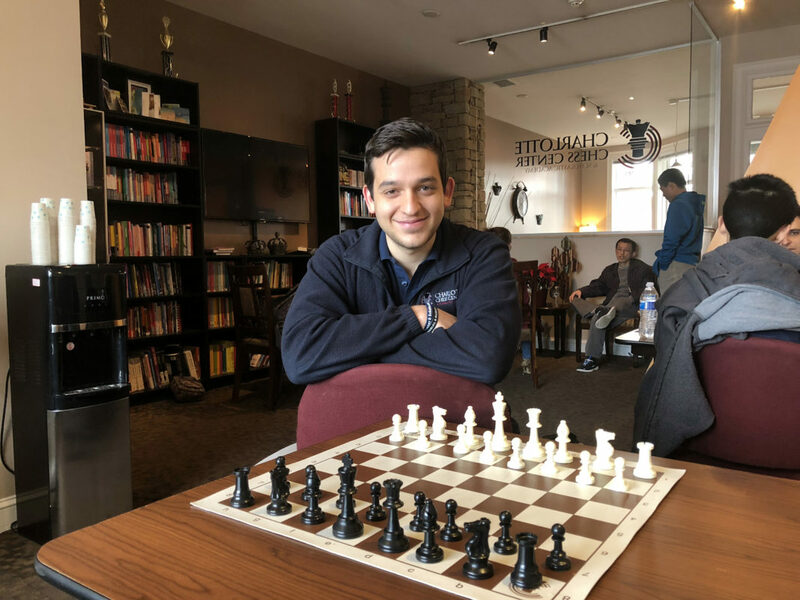 Michael lost in the first round, then scored four wins and one draw, including three wins in a row, including a victory over GM Alex Shabalov. His 4 1/2 points is a half point more than GM Alsonso Zapata, who lost to IM Tegshsuren Enkhbat in round seven. IM Carlos Perdomo has shown his class by coming back after losing his first two games to score four points in the next five rounds with three wins and two draws. Carlos drew with fellow Atlanta Kings member Sanjay Ghatti, who also has four points, last night in the seventh round. Shabba bested another Kings player last night, leaving FM Kazim Gulamali with 3 1/2. The Frisco Kid, NM Richard Francisco and the Denker representative from Georgia, Expert Reese Thompson each have scored 3 points. Thanks! The lower board we put camera, and I have to find good lighting tables, and those lower live boards are because under the main light of the room. I will post Neal Haris game soon. Yasser Seirawan was taking about the first time he saw the pieces being used at the STLCC&SC when at Rex Sinquefield’s home. Yaz said they are beautiful and were made specially for Rex by Frank Camaratta, who owns the House of Staunton. I have had the pleasure of being in the home of Mr. Camaratta, which looks like a museum with all the wonderful chess sets on display. Yaz said these particular pieces are to be used with the board for broadcast and there only twenty-five such sets. One can do things like that when one has a billion dollars at one’s disposal. Our poor chess cousins in the Great State of North Carolina, my adopted “second state,” are doing the very best they can with their much more limited budget.